Handmade from layers of resin with tiny handmade clay redcurrants on top. Dusted with gold pigment for that decadent touch. Fixed with a gold lobster clasp. Ideal for a purse or phone charm. Approx 2cm all round dimensions. 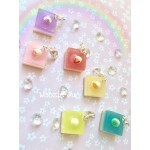 Fruit Slice Juicy Resin Charm! Handmade from layers of resin with a tiny fruit decorated cream swirl on top! Fixed with a silver lo..